I, along with my husband and three children love dressing up for Halloween. It’s a family tradition! 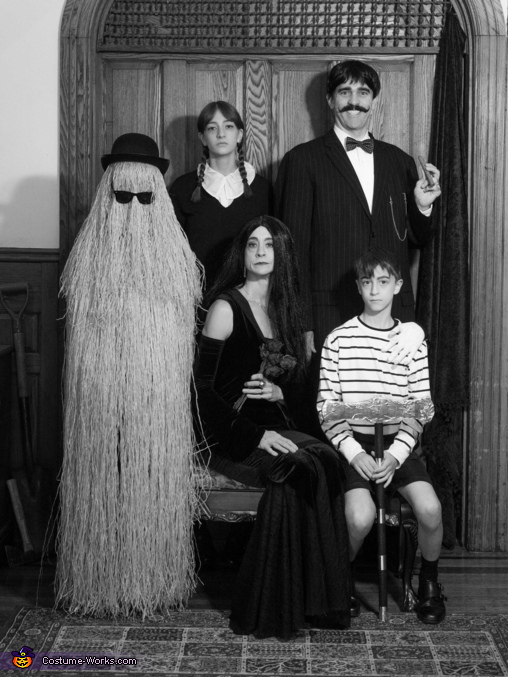 This year we decided to go with a classic, and chose the quirky, creepy, lovable Addams Family! Presenting... Morticia, Gomez, Pugsley (guest starring The Thing) and Wednesday Addams, along with the ever-so-adorable Cousin Itt! Aside from Gomez and Morticia’s wigs, and Cousin Itt’s bowler hat, all other items were either from thrift stores, re-purposed, OR were from dollar stores or deep discount stores. Total spent for the costumes (wigs and black hairspray too) combined was around $65. Gomez’s suit was the single greatest cost which came in at $22 from Goodwill. Cousin Itt’s costume took the most time to create. 700 ft. of polypropylene twine from The Dollar Tree was unraveled to get the effect of hair. The hair was made in two tiers. The top section was affixed to a stocking cap from The Dollar Tree which hid underneath the bowler hat (see photo), and the lower tier was attached around my son’s shoulders with a safety pin. Both sections used the technique of looping a double length of the twine around a strong cord (think latch hook technique). After experimenting with a couple different methods this ended up being MUCH easier than sewing or gluing on individual lengths of hair. Gomez’s suit came from Goodwill. The mustache is real! My husband cut off his full beard and left the mustache for the night. He darkened it with mascara, which worked very well to give it form and shaping ability. Morticia’s dress was repurposed from an earlier Halloween and had previously been purchased at a thrift store. I wore it backward and opened up the seam to create the neck-line plunge. The sleeves were removed from the dress and worn upside down for a dramatic effect. Also, the width of the lower part of the dress was drastically tapered by sewing, then a circle of black lace fabric was added that trailed onto the floor, again for more drama. Wednesday’s dress was found on a clearance rack at Forman Mills for $1! Wednesday’s shirt came straight out of my closet and thankfully fit my daughter. It was another year of great Halloween adventures, made even better by our amazing neighborhood!